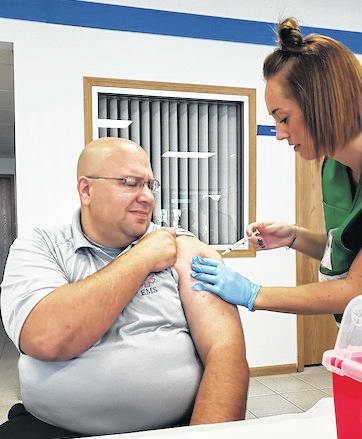 Jeremiah Woodmansee, Morrow County Paramedic EMT, focuses sharply as he receives his annual flu shot from Morgan Kocher, MCHD Public Health Nurse. It’s impossible to get flu from the influenza shot. On Saturday, Morrow County Health District partnered with Morrow County EMS and Hursh Drug Pharmacy to offer a Community Walk-In Flu Clinic to Morrow County residents. While there was a good amount of participation from local first responders and community members, Morrow County Health District wants to remind all Morrow County residents to get the flu shot. If you missed this Saturday’s Walk-In Flu Clinic, check with your local pharmacy as Mount Gilead’s Discount Drug Mart, Kroger, Rite Aid and Margeno’s Essentra all offer walk-in flu shots. The Morrow County Health District also offers flu shots by appointment. When thinking about getting a flu shot this year, you may be reminded of the common flu shot myths. We sat down with Stephanie Bragg who dispelled some of these. Myth: Flu shots don’t work. “No medicine is 100 percent effective, and the fact that the flu virus changes itself each year makes it even more challenging. Every year, scientists study past and current flu viruses to come up with the most effective flu vaccine that they can. Recent studies show that getting the flu vaccine protects you from the flu 40 to 60 percent of the time. It may not be perfect protection, but I’d rather lower my chances as much as I can; getting the flu vaccine helps do that. Jocelyn Fykes is Emergency Preparedness Planner, Morrow County Health District.